Tosoh Bioscience offers solutions for research, drug discovery, clinical chemistry, environmental analysis, manufacturing, and other industrial applications. The product portfolio encompasses a comprehensive line of media and prepacked HPLC columns for all modes of liquid chromatography and GPC instruments. Tosoh Bioscience offers chromatographic workshops, on-site training, and is the sole sponsor of the International Conference on Hydrophobic Interaction and Reversed Phase Chromatography (HIC/RPC). Our technical support specialists provide assistance in HPLC and process method development, chromatographic best practice, troubleshooting and provide in-depth on-site training and help packing process columns. Our state of the art manufacturing sites in Japan provide products to the sales and support network across the world. Tosoh Bioscience’s European headquarters are located in Griesheim, Germany, with customer service and supply chain in Tessenderlo, Belgium. The markets we serve comprise of Europe, Middle East and Africa. All instruments, columns and media sold by Tosoh Bioscience GmbH are manufactured at Tosoh’s Nanyo Complex (4560, Kaisei-cho, Shunan-shi, Yamaguchi 746-8501, Japan). All orders are processed and all chromatography and diagnostic products are shipped from this ISO 13485/9001 registered facility. 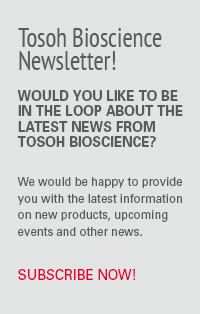 Tosoh Bioscience offers a broad range of prepacked columns for high-performance liquid chromatography (HPLC). They include the most widely used modes of liquid chromatography, such as ion exchange, hydrophobic and hydrophilic interaction, reversed phase, size exclusion, mixed mode and affinity. TSKgel columns for high-performance liquid chromatography are renowned for their quality and reliability. Filled with high purity silica or polymer based resins and functionalized with a broad range of ligands the columns are utilized in a variety of research and day-to-day applications. Over 500 scientific publications, using TSKgel columns, prove their outstanding quality and cutting-edge technology. For over fourty years Tosoh has continued to be the world leader in the analysis of proteins — our silica based TSKgel SW columns are the industry standard for size exclusion chromatography (SEC) of proteins. Tosoh Bioscience provides chromatographic solutions for today’s biological purification needs in downstream processing. Our experience in polymer chemistry and surface modifications allows us to design higher performance chromatographic resins based on macroporous polymeric matrices. TSKgel and Toyopearl resins are specifically designed for use in biopharmaceutical production. They are applied from capture, through intermediate purification, to polishing in more than 700 patented purification processes. Based on a rigid methacrylic polymer structure, the resins show excellent physical strength and flow characteristics, resulting in faster process throughput. Optimized pore diameters and narrow particle size distribution allow rapid kinetics and exceptional resolution. Tosoh’s portfolio of over 500 specialty products can be used to purify almost any biological moiety including proteins, peptides, MAbs, enzymes, etc. To support the use in regulated environment, we maintain “regulatory support files” for our process media. Tosoh has a long and successful history in manufacturing instruments for gel permeation chromatography (GPC) for the Asian market. Based on the wide experience in GPC instrument design and GPC column technology, Tosoh has developed the EcoSEC systems to meet the market demands for high throughput, semi-micro GPC. EcoSEC is a compact, all-in-one GPC system for fast, high resolution, semi-micro GPC. Comprising a precision solvent delivery system, automatic injector, column oven and high performance refractive index detector, the design of the system components, their configuration and the optimized flow line provide outstanding performance with minimized dead volume. This permits the use of smaller columns such as the well respected TSKgel SuperMultiporeHZ semi-micro GPC columns, featuring calibration curves with superior linearity. Semi-micro GPC allows fast, efficient analysis and reduces solvent consumption. EcoSEC can be equipped with additional detectors like UV, light scattering and viscosity detectors.